Agar is a jellylike substance derived from the purified cell walls of red algae. It is added to microbiological media, which are materials on which microorganisms are grown in laboratories, in order provide more of a solid structure to the substance. 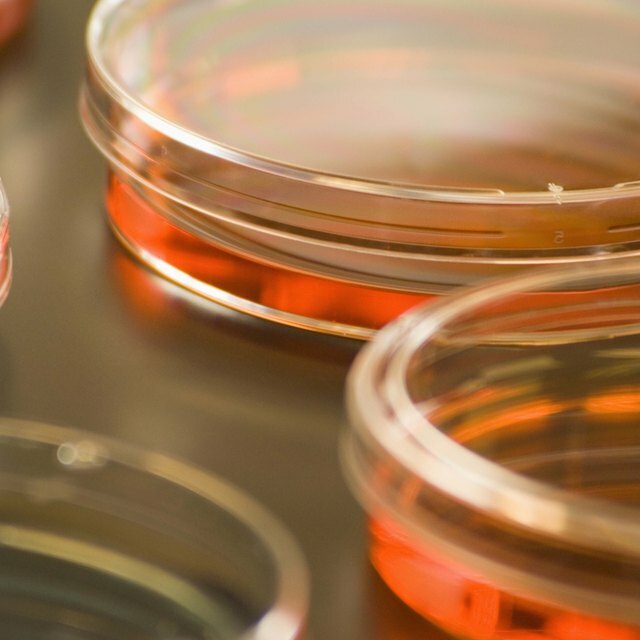 Agar has no nutritional value, so when scientists use it to culture microorganisms, they add various nutrients to increase bacterial growth in petri dishes or test tubes. When researchers store bacteria in a test tube, it is referred to as an agar slant because the liquid growth media solidifies while the tube is in a tilted position. A screw-cap top on the slant prevents the agar from drying out. The medium is prepared differently for slants than petri dishes. Sterilization is done with the agar in the tubes; petri dishes are pre-sterilized before sterilized agar is poured into them. Measure the amount of water needed and put it in an Erlenmeyer flask. Heat it on a stove until it is almost boiling. Add other ingredients if needed and stir the mixture slowly and constantly until they dissolve. These ingredients may include beef extract, peptone, and pH buffers, depending on the type of microorganism being cultured. Before adding the dehydrated agar powder, mix it with a small amount of cold distilled water to prevent lumping. Use caution when adding agar to the hot liquid since it can foam and overflow the pot. Add small amounts of agar at a time and stir to evenly distribute the agar. Turn off the heat when the mixture begins to steam, before it boils. Place the uncapped test tubes on a test tube rack. Fill the test tubes by transferring about 5 milliliters - about 0.17 ounce or 1 teaspoon - of the molten agar from the pot using a sterile pipette. Loosely cap each of the test tubes, because the agar won't be sterilized if they are sealed tightly. Sterilize all the tubes in an autoclave for about 25 minutes at 121 degrees Celsius, or 250 degrees Fahrenheit. When the agar is still hot, carefully tilt the rack holding the test tubes on a solid surface or a thick book, making sure the medium inside the tubes is at a slanted position relative to the test tubes. Allow the medium to cool and solidify at this angle, which increases the surface area of the agar. Tighten the caps of the test tubes after the agar has cooled. The slants are ready for use once the agar has solidified. They can be stored at room temperature or in the refrigerator for future use. Inoculate the slant by transferring cells with an inoculating loop from a single-colony microorganism on a plate to the slant's surface. Move the loop across the surface of the slant and recap the tubes. Incubate the slant until there is evidence of growth, then put the tube in a refrigerator. , Nicola. "Five Steps to Prepare Agar Slants." Sciencing, https://sciencing.com/five-steps-prepare-agar-slants-12070149.html. 16 May 2018.